Interest Groups, Firms Have Reported Spending $21.6 Million To Lobby State Government So Far In 2018. We Track The 200 Groups Spending The Most. LANSING (SEPT. 21, 2018) — While many eyes are on Michigan’s voters in 2018 — an election year that could reshape state government — lobbyists haven’t taken their eyes off lawmakers’ votes. According to new data submitted to the Secretary of State, lobbyists reported spending $21.6 million to influence state government over the first seven months of 2018. 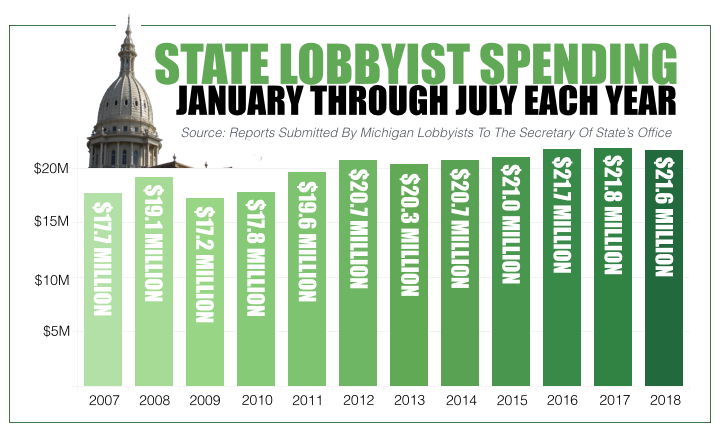 It’s the third highest total for lobbyist spending over the first seven months of a year. It’s also a total that falls just shy of the record pace for lobbyist spending set last year when lobbyists disclosed spending $21.8 million over the first seven months. A year earlier, in 2016, lobbyists spent $21.7 million over the same time period. They went on to set the state’s record for spending for an entire year in 2016: $39.9 million. The new numbers suggest that total spending for 2018 could come close to that record from 2016. After Election Day, lawmakers are expected to return to Lansing where they could pass a flurry of bills in a lame-duck session before the end of the year. Michigan lobbyists and interest groups that employ them file reports on their spending twice a year. By the end of August, they must disclose their spending totals for the first seven months of the year. By the end of the following January, they must disclose their spending totals for the final five months of the year. Groups report on their spending to influence state officeholders’ votes on specific bills or policies. These efforts could include paying lobbyists to convince lawmakers to vote a certain way, buying meals for officials, sending them on trips where lobbying takes place or sponsoring mail campaigns that are meant to influence legislators. Groups also pay lobbyists to do many thing that fall outside of what has to be disclosed under Michigan’s rules. Those things could include monitoring committee hearings, tracking legislative decisions and providing consulting services. That’s why the disclosed numbers for lobbyist spending capture just a portion of what lobbying firms are actually being paid. And when it comes to lobbying in Michigan, multi-client firms that represent a variety of groups and causes are the biggest players . The Michigan Campaign Finance Network tracks the 200 biggest spenders on lobbying each year. You can access our new list of who spent the most on lobbying over the first seven months of 2018 by clicking here. According to the newly released numbers, multi-client lobbying firms were 11 of the top 12 spenders. The top three spenders were Governmental Consultant Services Inc. (GCSI) at $926,195, Kelley Cawthorne at $810,213 and James H. Karoub Associates at $778,895. However, multi-client firms don’t have to report how much they’re spending on behalf of each client they represent, but they do have to list their clients. GCSI’s client list includes the City of Detroit, the Auto Dealers of Michigan and the University of Michigan. Kelley Cawthorne’s clients include 3M, the Pharmaceutical Research and Manufacturers of America and Wayne State University. James H. Karoub Associates’ clients include Ford Motor Company, Greektown Casino and Michigan State University. The only spender among the top 12 that wasn't a multi-client firm was the Michigan Health and Hospital Association, which ranked eighth at $272,414. 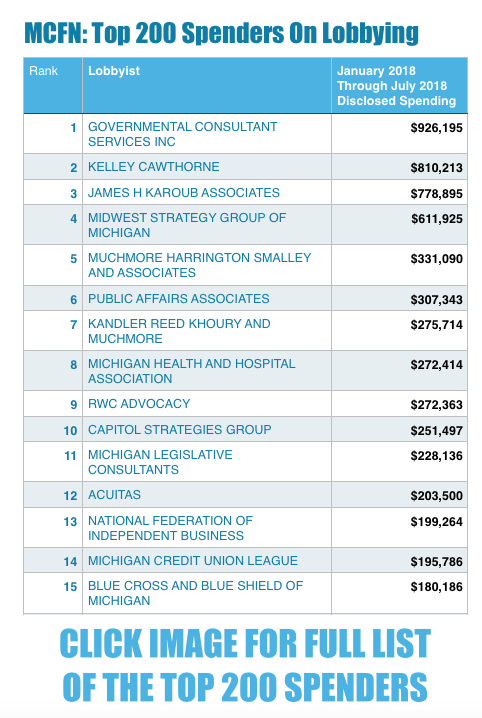 Other non-multi-client lobbying firms that ranked among the top 20 spenders were the National Federation of Independent Business ($199,264), the Michigan Credit Union League ($195,786), Blue Cross Blue Shield of Michigan ($180,186) and the Michigan Dental Association ($132,203). — Two groups with heavy interest in Michigan’s prevailing wage law boosted their spending on lobbying. In June, lawmakers voted to repeal the law, which set wage standards for publicly-funded construction projects. The National Electrical Contractors Association, which opposed the repeal, reported spending $120,000 on lobbying over the first seven months of 2018. Over the same time period in 2017, the group spent just $50,000. Similarly, the Michigan Regional Council of Carpenters, which also opposed repeal, reported spending $71,610 on lobbying over the first seven months of 2018. Over the same time period in 2017, the group spent just $10,996. 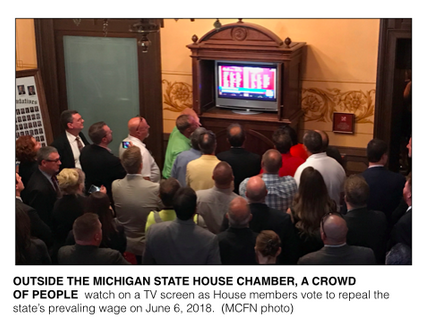 The Associated Builders and Contractors of Michigan, which championed prevailing wage repeal, increased its spending by a small amount. Over the first seven months of 2018, the group spent $47,619. Over the same time period in 2017, the group spent $43,724. — One of the new groups on the top 200 list was Waymo LLC, a self-driving car company. Waymo LLC reported spending $37,618 on lobbying Michigan state government over the first months of the year. The Legislature approved laws on self-driving vehicles in 2016. Other technology companies to make the top spenders list included Facebook, which spent $30,136, and Google, which spent $28,367. — Another newcomer to the list was the Convention of States Action, a national group that wants to call a convention of the states to propose constitutional amendments to “impose fiscal restraints on the federal government, limit its power and jurisdiction and impose term limits on its officials and members of Congress,” says its website. The group reported spending $31,541 on lobbying state government over the first seven months of the year. Resolutions to call such a convention have been introduced in the House and the Senate. In both chambers, the resolutions advanced out of committees and are currently awaiting pending votes from the full House and the full Senate. — Public institutions that are funded by tax dollars also shell out money to lobby state government. On the new list of the top 200 spenders were seven universities, two state agencies, two cities and one county. Among them were Michigan State University ($87,735), the Michigan Department of Treasury ($80,000) and the University of Michigan Board of Regents ($73,087). Gov. Rick Snyder’s office reported spending $48,000 — the same amount it reported over the same period last year.